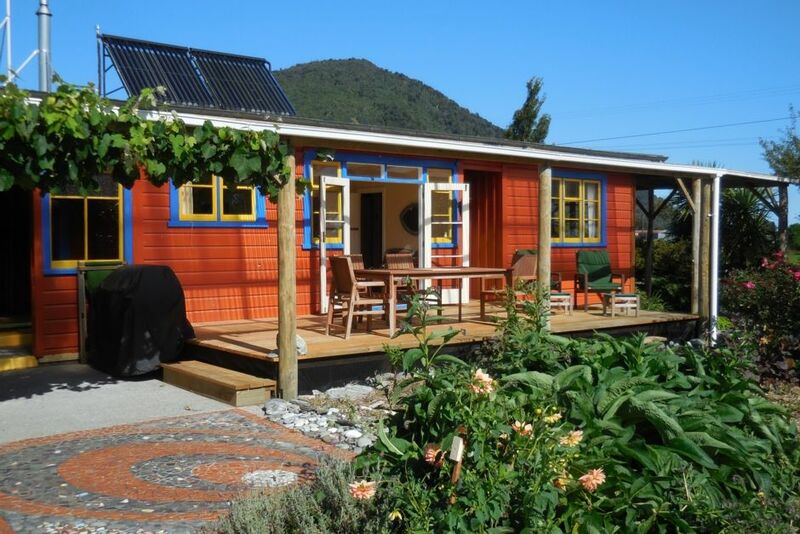 With mountain views on three sides, the cottage is 22 km from Hokitika on the road to the stunning Hokitika Gorge. It was built in the 1950's for the farmer's father on a small terrace to keep it high and dry. Beautiful original wooden floors throughout complement the rustic and eclectic decor. Modern renovations are in character and great beds assure a comfortable sleep. The covered deck was built to the sun and allows all weather outdoor living. On a clear night, stars fill the sky. Farm machinery, cows, milk tankers, and cars heading to the Gorge are seen occasionally. The Hokitika Gorge Scenic Reserve is 10 minutes away as is the character filled Kokatahi pub and cafe. Lake Kaniere with hiking and swimming is 20 minutes away. Off the main tourist trail, Camelback Cottage is a great place to relax and unwind. Cell phone coverage in the area is patchy but we have an internet phone and high speed internet for Skype and Wi-Fi. There is a 2 night minimum for stays at this property. Significant discount if you bring your own linens. Please inquire. No parties or additional guests staying beyond those booked. No tents or extra overnight guests without prior permission. This quirky cottage was perfect for our needs. Quiet, inside and out, there was enough space for two couples to spread out and relax. We loved the fire burner and the porch. The kitchen came well-equipped meaning we could eat at the cottage whenever we wanted. Close to the gorge, the beach and town, it was perfectly located. It was all great! Thanks!!! Has all the facilities to meet all needs, Cosy and warm, well-placed to discover the area. This is a quirky, fun cottage with large living areas indoor and out. We did not utilize all of the goodies, as the focus was to explore. Beds are great, cooking facilities top class. Very clean, great washing and bathing. The only surprise was the volume and noise of road traffic en- route to the Hokitika Gorge -- did not affect our sleep performance. Will return with guests as cottage will be great for 2 couples. What a joyous experience! Beauty all around. A wonderful garden and an eclectic interior. Well supplied. Even an emergency kit for a scuffled up knee. Plan to stay several days because however long you stay, you will wish you didn’t have to leave. This quaint, charming, well maintained cottage is surrounded by a beautiful flower and fruit garden, with nearby farm pastures and mountains in the distance. The gorgeous Hokitika Gorge is just a few minutes drive away. The laid back, historic, picturesque village of Hokitika is only a 15 minute drive. We enjoyed a full week here and enjoyed the clean comfort, artful decor, modern facilities and privacy. The owner, Martha, was very friendly and engaging. She kept in touch through email, and has a son living in Hokitika, so we had excellent support in case we needed it. The internet was strong, there is Netflix on the "smart TV", good water pressure in the shower, comfortable beds and lounge, a good kitchen, birds in the garden, beautiful views in a wonderful country. All splendid! The only tiny down side was a bit of road noise from the milk trucks. We suspect the house was originally built on perhaps a less traveled gravel road. Gorgeous house and garden. Really private. We loved the bath! We had a great stay at Camelback Cottage! A tidy, well put together accommodation with everything you need. Martha was extremely helpful with directions, instructions and communications. We really enjoyed our time in the country.